Presently this is a job in the early discussion stage. 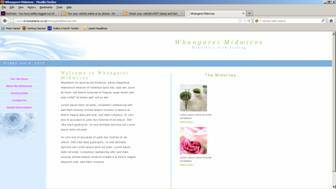 A group of midwives based in Whangarei, where I live in New Zealand, have realised that whilst they have been established for a long time they are falling behind other similar groups because they do not have a presence on the Web. I have set out for them the costs of purchasing a domain name and setting up some siutable hosting arrangements as well as my charge for creating the web site. The site, as shown in the picture alongside this text, is only draft 1 of a possible home page.